Sporting a brand new #4 ranking next to their name for the first time this season, the Seward County Lady Saints dominated the visiting Dodge City Conquistadors Wednesday night in the Greenhouse, using a 60-14 run through the second and third quarters to blow the Conqs away 102-43 to up their undefeated record to 16-0 on the year. It was an unusually slow start for the Lady Saints on offense who scored just six points through the first 4:30 Wednesday night, but the Seward defense made up for it, holding Dodge City without a single point through the first 3:30 to hold a 6-3 lead on the Conqs early on. Molly Mounsey and Neidy Ocuane connected on back to back threes to get Seward going and put them up nine and the Lady Saints used the momentum to score 16 points over the final 5:17 of the first to take a double digit lead after one 22-11. Seward began the second on an 8-2 run to open their lead to 15 and continued to heat up getting a three from Erin Richardson and some strong post play from star Joanna Grymek and reserve Manuela Fungate as they pushed their advantage to 20 for the first time on the night at 39-19. Another Mounsey three and a Caro to Caro hook up from twins Vanessa to Valerie put an exclamation point on the second quarter for Seward as the Lady Saints led the Conqs 51-23 after 20 minutes of action. The Lady Saints shot 49% in the first half, led by 12 from Ocuane while holding Dodge to just 28% shooting and forcing 12 Conquistador turnovers. 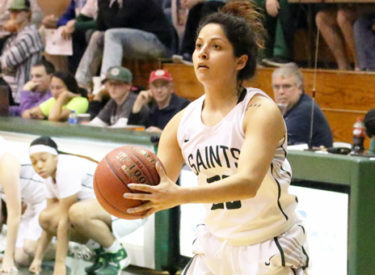 The Lady Saints opened the second half as they finished the first, on fire, as Seward scored on four of their first five possessions of the third quarter, stretching their lead to 62-23 after just 1:50 of action. Defensively they were just as good, holding Dodge without a single point for the first 5:10 and without a field goal until the 1:31 mark of the third as they blew the game wide open to 83-29 after three quarters of action. The Seward bench took over in the fourth and didn’t miss a beat as a 6-0 run midway through the period pushed their lead to 93-36. A pair of triples from Vanessa Caro put the Lady Saints on the brink of the century mark and after a two minute wait to get there, Caro popped in a free throw at the line to give Seward 100 and they would score once more to finish the Conqs off 102-43. Seward shot just under 50% in the win while holding Dodge City to just 18% shooting in the second half and 23% in the game. Seven different Seward players scored in double figures led by 16 from Mounsey and 23 off the bench for the Caro twins. Fungate also gave the Lady Saints a solid effort off the bench, just missing a double double with nine points and nine rebounds. The win is Seward’s 21st straight over Dodge City as the Lady Saints have little trouble improving to 16-0 overall on the year. Seward ups their Jayhawk Conference mark to 12-0 while Dodge falls to 3-13 overall and 3-9 in conference action. Seward will wrap up the first half of conference play on Saturday night when they travel to Garden City for a 5:50 tip against their rivals from the North in the Perryman Center.